The automaker is betting big on Level 3 autonomy. The self-driving future has a ratings scale. The classifications begin at zero, where you're constantly in charge of all the car's acceleration, steering and braking. Basically a car without cruise control. It ends with Level 5, where the car that doesn't even need a steering wheel or a driver. 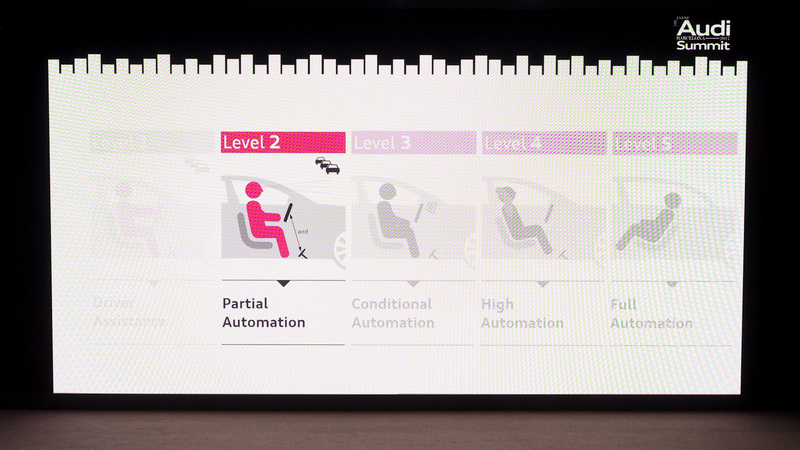 Currently, if drivers want semi-autonomous features they're getting a Level 2 experience. Like Tesla's Autopilot or Cadillac's Super Cruise, the car can drive itself in specific situations (usually on the highway) but require the human behind the wheel to pay attention and take over at a moment's notice. 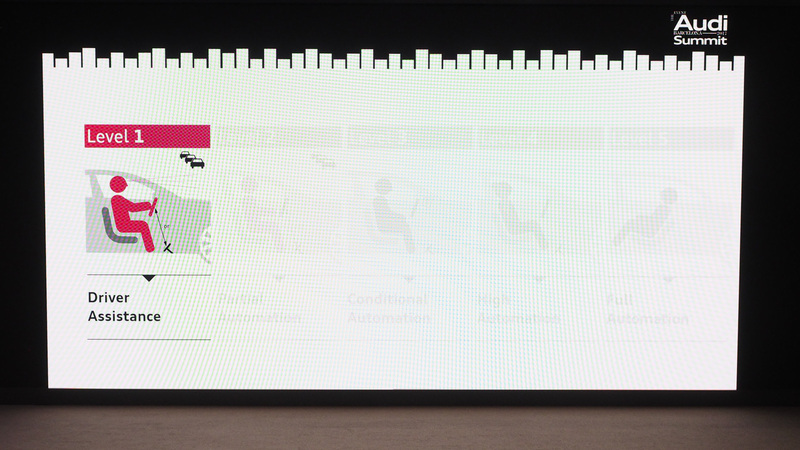 At its first tech summit, Audi introduced the new A8 with Level 3 autonomy. It's the first production vehicle that'll let the driver actually stop paying attention while the car drives itself. It's also a big deal for the automaker and drivers that really need to update their Facebook status while commuting. Here, the company is making a bet that other companies have decided to pass on. Most automakers see Level 4 as the next logical step for their vehicles. At that stage, the car is is almost totally in control all of the time without any human interaction and will only stop itself if there's a system failure or the conditions dictate that the human behind the wheel needs to take control. A Level 3 vehicle can also drive itself without the driver paying attention. But not all the time and usually only in certain circumstances. Still, that's a huge leap from what's currently on the road and requires constant supervision by the driver. But before you start planning on napping while driving to work, this level of autonomy still requires the driver to take over if the system gets confused or fails. It's that last bit that's had automakers like Volvo and Ford publicly state that they will go directly to Level 4. The argument against a Level 3 vehicle being sold to the general public is about safety. If a driver becomes too dependent upon the car's autonomy, they're less likely to intervene when the system fails. While Elon Musk has called out these automakers for withholding what he perceives are additional safety features that would ship with a Level 3 car, it's likely that Tesla will jump to Level 4. Musk has even noted that Level 5 autonomy will be available in approximately two years. Audi's system seems to address some issues around Level 3 driving with Driver Ability Detection. This brings the car to a stop if it determines that the driver is not attentive and able to take control of the vehicle after 10 seconds of audible and visual warnings. At that point, the vehicle turns on the hazard lights and alerts Audi. Also it's not Level 3 everywhere, just in heavy traffic going slower than 37 miles per hour. Even then, Audi's Traffic Jam Pilot feature requires that the vehicle is on a divided highway with a barrier or at least a median between the vehicle and opposing traffic. Basically it's the road most people drive everyday to work. It's a very specific circumstance that many people deal with everyday and during that time, the A8 will drive for you and, I can't believe I'm saying this, you can text your friends while behind the wheel or even watch TV as noted by Audi. The biggest obstacle to the vehicle being able to deliver on all its technical promises is regional regulations. While an A8 can drive itself without the driver paying attention, where it's being driven will determine whether it's allowed to. That's going to be true for many vehicles in the future. Just because a car delivers Level 4 or even Level 5 automation, it doesn't mean lawmakers are going to let it actually happen on the roads under their watch. So if you live in a state or country that allows Audi's flagship luxury sedan to take care of the heavy lifting while you're commuting, count yourself lucky. The automaker may be going all in on Level 3, but it hinted at the ability to update the new A8 to Level 4 capabilities via a software update -- if the hardware can handle it. Regardless of how lawmakers initially react to the new car's technology, Audi is moving forward. The company will further fine-tune its AI and algorithms in anticipation of an autonomous world. The A8 isn't so much a bet as an investment for Audi, as it levels up in the world of self-driving vehicles.